Vision is something that we often take for granted. It’s not until there’s a problem that we realize just how precious sight really is. While all of us need to make sure we keep our eyes as healthy as possible, if you have diabetes, you should be extra careful to “keep an eye” on your vision. May is Healthy Vision Month, so what better time to jump on the bandwagon and take steps to ensure that you’ll be seeing clearly many, many years from now! Get that dilated eye exam. You’ve heard it before, and you’ll no doubt hear it again: A dilated eye exam is one of the best steps that you can take to catch any eye problems early on. For example, diabetic retinopathy, a leading cause of blindness, may not present with any symptoms, at least in its early stages. Other eye problems common in people with diabetes include macular edema and glaucoma. A comprehensive dilated eye exam is the best way for your eye doctor to pick up on problems and treat them to help preserve your vision. With this exam, your eye doctor will place special drops in your eyes to widen (dilate) your pupils. 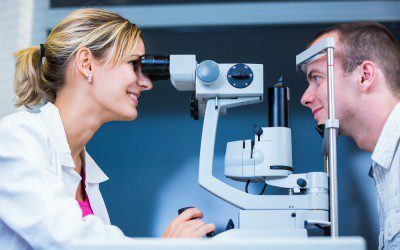 That allows him to look at your retina, macula (an area near the center of the retina), and optic nerve, and check for signs of retinopathy or other eye diseases. Your vision will likely be blurry afterwards, so you’ll need someone to drive you home. For most people with diabetes, it’s recommended that you have a dilated eye exam every year; people with existing eye problems may need them more often. • Cataracts, a clouding of the lens of the eye that can blur vision. Having diabetes boosts your risk of cataracts, by the way. • Macular degeneration, which is damage to the retina that destroys central vision. Macular degeneration is the leading cause of vision loss in the U.S.
• Pterygium, a tissue growth that alters the shape of the eyeball and can cause astigmatism. • Eye cancer. It’s thought that too much sun exposure may raise the risk for melanoma of the eye. When choosing sunglasses, don’t be fooled by the high price or the color of the lenses; instead, look for sunglasses that provide 99–100% UVA/UVB protection. If you’re not sure what to buy, check with an eye-care professional. Also, get in the habit of wearing sunglasses even on cloudy days. You’ll look cool, and you’ll be saving your sight! Eat your fruits and veggies. Really! You may be tired of hearing this, but fruits and vegetables contain nutrients that really do help your vision. Leafy green vegetables, such as kale, spinach, and collard greens, contain lutein and zeaxanthin, nutrients found in the eye that lower the risk for macular degeneration and cataracts. Citrus fruits, strawberries, peaches, and tomatoes are bursting with vitamin C, an antioxidant that also fights macular degeneration and cataracts. And don’t forgot those carrots, which help to preserve night vision. Boost your omega-3 fatty acid intake. Omega-3 fatty acids are a type of polyunsaturated fat that provide a host of health benefits. When it comes to vision, omega-3s are thought to help preserve healthy vision; prevent dry eye; and possibly help prevent diabetic retinopathy, glaucoma, and age-related macular degeneration (although more research is needed in these areas). In the meantime, focus on foods that are rich in these healthy fats, such as salmon, tuna, and mackerel. If you suffer from dry eye, talk with your eye doctor about possibly taking a fish oil supplement. Don’t smoke. Smoking is bad news all around. Besides leading to heart and lung problems and raising the risk of some cancers, smoking can contribute to macular degeneration, cataracts, optic nerve damage, and possibly even diabetic retinopathy. Now’s the time to stop, if you haven’t already. There are many things that you can do to stop smoking — talk with your doctor or diabetes educator, or go online and check out smokefree.gov for help. Do your best to manage health conditions. It seems obvious, and you know that taking care of your diabetes, blood pressure, cholesterol, and any other chronic conditions is very important. Having a chronic condition can impact your vision by raising the risk for retinopathy, glaucoma, optic nerve damage, and blindness. It’s not easy, though. If you’re struggling to, say, keep your blood sugars, HbA1c, or blood pressure in your target range, ask for help. You may need a change in medicine or different medicines. Changes to your food intake can help, as can losing weight and being physically active. Your health-care team can help you tweak your treatment plan to help you live a healthy life. The thought of having eye problems and possibly losing your vision is frightening. But don’t let fear stop you from taking the steps above. Blindness, vision impairment, and other eye problems are preventable and, in many cases, treatable. Make May — and every month — vision health month for you. An unexpected turn of events leaves Amy Mercer searching for a new endocrinologist — and fantasizing about her dream doctor. Bookmark DiabetesSelfManagement.com and tune in tomorrow to read more.